The rocks near the village of Les Mees, France stand in columns and extend across the landscape for over two kilometers. 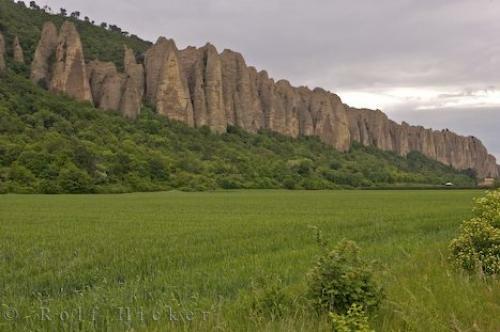 Photo of rocks known as the Les Penitents Des Mees near the village of Les Mees in the Provence, France. ... Les Mees, France is worth a stopover on your journey to see the columns of rocks and to relax and get a peaceful evening to catch up on a night of well needed sleep.Les Penitents des Mees, rows of columnar rocks over 100 metres high and over 2 kms long near the village of Les Mees, Alpes de Haute, Provence, France, Europe. I photographed this photo with the digital SLR camera model Canon EOS-1Ds Mark II, aperture of f/6.3, exposure time of 1/80 sec. on ISO 100, as always I used a original Canon Lens, the focus lenght for this picture was 38mm.